My wedding planning was done totally remotely and I randomly came across dreamcatchers through wedmegood. Just looking at one or two pictures I immediately knew this is what we are looking for. Ashwini was super helpful and nice since the day I got in touch with her. Initially I was little hesitant due to the price quote I was offered but Ashwini worked with me and modified the quote to match our end goal. This right here shows their quality of service and customer care. Their work is so good that we ended up watching all the cinematography videos they shared with us and just wanted to watch more. My wedding planning was done in a short span of time and I didn't have time to give them lot of details and just gave them a rough idea of what I wanted. Punit and his team are super professional and they needed no direction. They really love what they do and you can see it in their work. All the wedding guests couldn't stop raving about them as they didn't ask anyone to move around during any of the ceremonies to get pictures of us. Punit and team did an amazing job capturing every single moment and all the pictures look very natural( not posy) and lively. I can't imagine my pictures looking any other way. They are also very friendly and fun to work with. We had our reception about one and half month later and needed few pictures or a trailer for the event. Punit and Ashwini were amazing and were able to provide us with all our pictures and videos in such a short span without any hesitation. The cinematic videos truely show their talent and passion and those videos looked incredible. To summarize it, they make the your big day look way better on the camera and makes you forget all the painful wedding planning. Thank you Sindhu for your kind words!! We too had a great time covering your event. Lots of love to you and Sunny. Thank you Richa! You and Khushil already know how much we enjoyed covering your event and working with you :) Much love to you! I have no words to praise the entire team of dreamcatchers...they really do catch your dreams and give you everlasting moemories... Puneet has not only captured the pictures but our feelings too... excellent and very professional team...kudos to all of you... thank you so much.???? Thank you Priyanka! You shoot was an incredible adventure that we will always cherish :) best wishes to you and Yash! 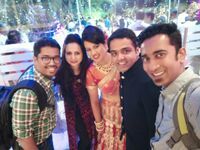 We had Punit and team cover our wedding in Hyderabad in July this year. This review is long overdue and since I am a person of few word, will keep this short and sweet. - Professionalism: 9/10 - Photography: 9/10 - Cinematography: 9.5/10 - Dedication and Passion for work: 10/10 - Delivery schedule adherence: 9/10 - Communication: 10/10 - Overall Experience: 9.5/10 Would I recommend them? Definitely! Team, thank you for the sweet memories. Dreamcatchers team is highly professional and best at their work. Have seen their work and have also seen the way they work. just one word - FLAWLESS. It doesnt seem like it is WORK for them. They have been really good with the delivery time of the picture/ videos. I and my partner approached them for a pre wedding video! We are more than happy and satisfied with the whole experience and the quality of workt that we got. Punit has always been very polite and friendly with us throughout the day and made sure we were comfortable enough for each shot also it was a proper on time wrap! Over all i have had a superb experience as a client as well as a small part of his team! i have already been recommending them to others and now i m looking forward for my wedding pictures next year???????????? Thank you so much Samidha :) ! We most certainly look forward to cover your wedding! We came across Dreamcatchers through WedMeGood. Punit is a great guy and he has an eye for perfection when it comes to his work. He and Ashwini have been really accommodative for our requirements throughout the wedding. My relatives loved the trailer that they made and the pics have come out really well! His team was really patient and focussed when they were on the job and all the wedding has been captured amazingly! One can almost instantly connect with Punit and it makes you comfortable to express what you really want from your photos and videos and he's just eager to learn about it. Thanks for the great memories guys! Waiting to catch up with you really soon whenever I land up in Mumbai! ???? We had come across Dreamcatchers Photography's profile and liked the work that we saw. We were having an intimate 2 day long Maharashtrian wedding and wanted an experienced team that could document our event with an artistic flair despite it being a small event. When they shared their portfolio with us, the sheer number of Maharashtrian weddings that we saw in there, which they had beautifully captured in the past had us convinced immediately that they were the right team for our event. On the event day, we could immediately sense that they were passionate about their work, were quite experienced and we didn't have to bother with any aspect of the coverage - be it decor, portraits, getting ready, emotions, as they had it all covered. Another thing we appreciated was that their team arrived at all the functions before time, we didn't have to chase them at all. I am a bit of a stickler for punctuality so noticed this immediately. Overall, we had a great experience and would highly recommend them to other couples looking for experienced and qualified team to cover their event. Wishing them luck for the future! It was our pleasure to cover your wedding and be a part of your family :) We were made to feel at home completely during your event. Thank you! We were so glad to have picked Punit and Ashwini! From the pre-wedding shoot all the way in Lavasa to the wedding in Mumbai, they did an exceptional job. ❤️ I found them on WMG and they won us over immediately! Everything was captured so well! Punit is the most easy going person and immediately understood that Khushil and I were not that comfortable in front of the camera. He asked us to just be ourselves and got every moment captured beautifully. We even got all our pictures and videos on time, which was something everyone was impressed with. It was a pleasure getting to know you guys. Thank you Richa and Khushil for trusting us with your event! You guys rock together, we've had a blast covering your amazingly fun wedding. I am glad I chose Dreamcatchers to capture my wedding. They are extremely passionate about what they do and don?t leave any stone unturned in delivering client satisfaction. They are always looking for creative ways to improve their work and make it stand out. I liked their work while i was looking for professional wedding photographers and after talking to them i was assured that i have chosen the right one...but only after the wedding was done and before the final work was received i realized that these guys really believe in making their clients happy, not just with their work but also with the kind of relation they maintain. They made every little change in the video that i asked for and made sure it comes out exactly the way i wanted it to be. All the best Dreamcatchers!! Long way to go!! Thank you for your kind words. We had a great time covering you royal Jaipur wedding! So just like any other couple we wanted our wedding photographs to be the best. We got married in nov last year but we began our hunt for photography well in advance. We researched through wed me good app and found Dreamcatchers photography and few others as well. We started meeting all our shortlisted photographers, not quite convinced until we met Punit and saw his work. AMAZING AND BEAUTIFUL was our instant reaction. He not only captures photographs but also emotions and moments. When we saw our pre wedding pictures we were so happy and convinced that we have got the best photographer. Soon we realised during our wedding functions not just Punit but his entire team did an outstanding job to give us the best memories in form of photographs for life. We and our families absolutely loved his work that even for my sister in laws wedding nobody had to think twice before finalizing punit again for the wedding. We would like to thank punit and his entire team for an amazing job done. We were fortunate to have had Punit and his team at Dreamcatchers Photography to cover our 4 day wedding in Mumbai. The entire flow from booking him to getting the pictures and videos delivered was very smooth. The pictures /Trailer/ Film were beautifully shot and the outcomes were fantastic.Punit was kind and very patient with all the hustling happening throughout the wedding and he was more like a friend to us throughout . Today as I look back to my wedding pictures , I cannot thank Punit enough to give me the best memories of my most special day in such a beautiful manner. Cheers to your entire team !! Thank you very very much !! Thanks a ton Tavleen! You will always be one of our most photogenic brides ???? was our pleasure capturing you and Nishchay in your wedding glory ???? When my brother decided to get married I immediately took on all the responsibility for the event. I always knew selecting a wedding photographer was the most difficult task as you always want the best photographs to remember your special day. I came across Dreamcatchers Photography on Facebook and fell in love with Punit's work. This man is not only fun to deal with but he got the most natural and beautiful photos without stressing anyone. He has true passion for his work and this reflects in his pictures and he works magic with his cameras. We are beyond happy with all the photos from the day as they brought back many intense emotions – from tears to so much laughter. I would recommend Punit 100% for any of your special occasions as we cannot thank him enough for the most amazing wedding album that he created for us. Thank you Reena. We had a blast covering Rohan’s wedding! Me and my now my husband had contacted the Dreamcatchers team , after some searching around.We had seen their work a one of our friend's events and liked them . Punit was the guy we got in touch with and our experience was really smooth there on with the meetings , the discussion of how we want the wedding film to be and what parts were important to us ; even our song preferences .Ours was a simple wedding at a simple location and haing said that the pictures delivered the beauty of our priceless moments.What we really like was the movie though; It wasnt exactly what we hoped for as we had wanted all my loved ones to be a part of it ; However when that didn thappen Punit made sure that he could do his best to deliver on what was decided upon and kudos to his team for beainrg with us for all the edits we asked.They patiently addressed to all of them and stood good on their word. The delivery of the material was also on time which made our folks as well very happy .Thank again the Dream catchers team . Thank you Vidhi for your kind words. After searching tirelessly for a photographer we finally found what we were looking for in Punit .His work stood out by a mile and We knew instantly that we had to choose him! Punit is an excellent photographer and artist and we are lucky to have the memories that he has captured. Our pre-shoot was hilarious and fun. He was absolutely brilliant from start to finish. Professional, efficient, friendly and, most importantly, took the most fabulous photographs of our pre wedding, in challenging weather conditions (!) getting soaking wet in the process. Thank You Dreamcatchers (Punit & Team ) Once Again... Lots of Love . I and Vishal, we both were anxious of traditional wedding photograph poses. Being the biggest day of our lives, we did not want memories of weird poses from our wedding photographs. We are so glad, that Punit and team vanquished all our worries, and left us with beautiful memories from our wedding and pre-wedding photoshoots. Pre-wedding photos - Punit was punctual and made us comfortable quickly. We had great fun feeling like celebrities being captured through the lens. We made awesome memories from that day, not only with the amazing photos that Punit captured, but also from the entire process of how he did the shots. Wedding day photos - Since, Dreamcatchers were going to capture candid photographs from that day, Punit and team acquainted themselves with close relatives and families from both our sides, so they knew who and which moments to capture. They did a fabulous job with the wedding photos; and to this day along with both of us, our families, relatives and friends keep complimenting the marvelous memories captured through Punit's lenses. Thanks again Dreamcatchers. I highly recommend them, if you are looking to record sweet memories of your live's eventful days. Thank you Divya! Wishing you and Vishal the best always!! We came to know about Dreamcatchers via WedMeGood and we decided to meet Punit before going any further. The moment we met Punit, we knew he was the guy capturing our wedding. He is a very humble and a very genuine guy. He understands the chemistry between a couple and his lens are the perfect tools to capture those moments. He and his team have an excellent coordination between each other and his humblesness towards his work is reflected through his genuinely exquisite work. If you are planning for wedding photographer and you want someone to capture your gorgeous intimate moments of the wedding, then Dreamcatchers and Punit is the guy for you. Thank you Sayali for your kind words! We not only enjoyed covering your event, we are also glad to have had the opportunity of interacting with sweet humans like you and Harshad. God bless you both! Thanks Vicky. Good luck to you and Yash. I never liked getting clicked and so was very confused about the pre wedding photoshoot... but it was a great experience and am happy I assigned it to Punit... he is a great photographer and a very friendly guy... will highly recommend him !!! I and Samskrita wanted a very simple wedding, as we both believe that spending a hefty sum of money on a wedding is a waste. But, what we both agreed upon is to record the memories in the best possible way. With the current trend of candid photography in weddings, we started looking for the perfect guy who can portray the simplicity in a beautiful, grand manner. After looking at the portfolios of some 6-8 professional photographers, we were not convinced, and were doubting our decision to hire a professional at all. But after the very first meeting with Dreamcatchers and their work, it didn't took us long to decide that we got our guy. Our relation with Punit became more like a friend since then, which I truly believe is very very important. He knows his work the best and you really do not have to worry about how your photos going to be. He will capture those beautiful moments at your wedding which you won't notice at that time but you will cherish for long. DC cares more than you when it comes to your wedding photography. Pratul, thank you so much for your kind words! It was our pleasure to be a part of your event. Punit is a great photographer and I highly recommend him. We had a family photoshoot with our 7 months old which required lot of patience as our little one was sick and needed lots of clothes change etc. He was very professional, had lots of patience and suggested great poses. All our photos turned out great and we love them. We would definitely work with him in future too! Thank you Deepali. We enjoyed capturing your precious moments with the little one. Punit had done the wedding photography for my sisters wedding and he had done such an amazing job that once I decided on my wedding dates, amongst the first few things I did was call Punit and ask if he was available on those dates. Ten minutes later he called back (my fingers were crossed) to say he was available and phew.. it was such a relief! Wedding photographs are something that we cherish for our life. My experience with Punit has been truly commendable - he is extremely professional, very calm(trust me it's very important to have calm people around you on your wedding day), he will understand very quickly what/ what not you are comfortable with. He manages to capture all the special moments in such a candid way. Like most brides I was also very fussy on all big or small aspects of the wedding. Photographs are probably the only thing that I didn't spend an extra minute on as I always knew that by having Punit on board I have nothing to worry about. As expected with Punit the wedding photographs have come out beautifully- thank you so much Punit and team for all the hard work and making my wedding memories so special! When I started planning my wedding, my brother introduced me to Punit and when I saw his work I knew instantly that we had to hire him. And he totally lived upto our expectations. I still remember he just gave me one Mantra on my wedding day – he told me – ‘Prachi, forget that I am here and capturing you in my camera, just be yourself, relax and enjoy your big day’ I followed his mantra and the result I got was outstanding!! Punit is truly talented and so passionate about what he does. Candid photographs captured by him are absolutely stunning and for me icing on the cake was the surprise short-film he made capturing all my family and friends. We are really lucky to have the memories that he has captured. Thank you so much Punit for your brilliant work… I have never met a CA who is so creative :D Keep up the good work!! Prachi, it was our pleasure to capture your wedding memories. Thank you for giving us this opportunity! We found Punit after a long search and meeting with lots of photographers. He is very professional, creative and very entertaining photographer. The length he would go to get that perfect shot and satisfaction of bride and groom is rare to find and something that should me commended. It really felt like we had another friend there with us throughout all of the crazy wedding planning and on the big day. He also gave us the reference of choreographer (Sourabh and Samidha) who made our Sangeet more entertaining and enjoyful. Thank you so much Punit.. You are amazing..!! Thank you Sunny. We had a great time covering you event :) We felt quite at home with you and Heena! Living up to their name, Punit and his team literally caught my dream and turned it into reality! Punit is one the most talented photographers I have known and I am glad I chose him and his team for my sangeet as well as wedding! He has so beautifully captured every emotion throughout the functions and has given us memories to cherish for a lifetime! He is so efficient, a silent worker, patient, alert, creative and he does all this with a wide smile on his face! May you achieve great heights and may your hard work and dedication take you places! All the very best Punit and a Big thank you to you and everyone at DreamCatchers Photography for all the hard work you put in to make my big day even more special! Puneet's passion for photography has no leaps. He will not let it pass unless he's satisfied with his work and that shows up in his work. My husband was pretty reluctant to get a photo shoot done but Puneet made it so much fun that we didn't realize how many hours were spent..Kudos to Dreamcatchers and special thanks to Puneet for creating such cherishable memories. Punit (Dreamcatcher photography) captured our wedding moments beautifully and created memories for us to cherish for years to come. Thank you for giving us such outstanding and fabulous pictures of our dream day. I never felt so comfortable being clicked before. He was so non interfering, almost invisible during the event. We were at ease all the while, he made us that comfortable! When we got the final images, they we simply brilliant and more than what we expected!! We truly relive every moment whenever we look at the photos he created. Wishing you luck Punit, keep up the great job!! Thank you Jyoti for your kind words! We had Dreamcatchers for all the functions- mehendi/sangeet, pre-wedding reception and a really early morning Tamil iyer wedding followed by a post wedding shoot a month later. Punit has the knack of being invisible and capturing all the in between moments, creating endearing candids. He captured the ton full of rituals (& relatives :p) beautifully, each picture is frame worthy. Very lucky to have chosen Dreamcatchers to shoot my wedding. Punit has an excellent eye for the detail. His approach is very professional. His clicks are perfect and are indeed a collection of precious memories. Thank you so much Dipti! Had a great experience with Dreamcatchers! They photographed my sister's wedding and I loved the photos they took of me. Kudos! Get best quote from Dreamcatchers Photography and book your date! Check their prices and availability. Send enquiry to your selected list of Wedding Photographers at WedMeGood and choose the best. Browse for more Wedding Photographers in Mumbai and more wedding vendors at WedMeGood and plan your wedding hassle free.